TEAC SL-D930 is retro-styled Bluetooth, CD and radio system | What Hi-Fi? TEAC has revealed details of a new all-in-one music system that combines up-to-date features and spec with a retro design. 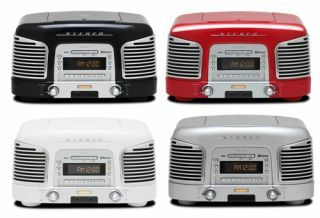 The TEAC SL-D930 combines an AM/FM radio (with up to 40 presets) with a top-loading CD player, while also supporting wireless Bluetooth streaming from smartphones, tablets and computers. A 2.1-channel speaker system is powered by a Class-D type amplifier capable of pumping out a total of 20 watts of power. The eye-catching design, said to be inspired by "chrome-bedecked classic 1950s American cars", is available in four colours, black, red, silver and white. Essentially a well-endowed clock radio, this TEAC system has snooze and sleep timers, and a variable-brightness digital clock. Completing the spec sheet are a front-mounted headphone input and an aux input for connecting other audio devices. You also get a colour-coordinated remote control. TEAC is no stranger to the all-in-one music system, with systems such as the AirPlay CR-H700DAB sitting alongside the more affordable NS-X1 dock system, though this is the first to sport such a retro design. Due on sale by mid-March, the TEAC SL-D930 system will set you back £199.